US Apple Store is down - new iPhone imminent? UK Store is still online. Just a local site update then? 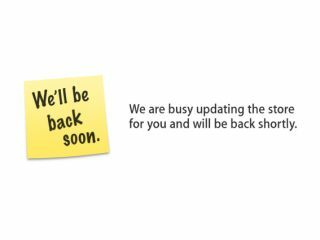 The US Apple Store is currently offline with the message "We are busy updating the store for you and will be back shortly". could be on the cards. Of course, the US Apple Store could also be down for a simple maintenance update too. This looks to be the most likely scenario as the UK Apple Store is still very much operational. Apple usually takes down all its international stores whenever product updates are due. We'll just have to wait and see, won't we? More news as it breaks.